In an exclusive interview with RIR, Alex Popov, a founder and president of the Moscow Diamond Bourse and Chairman, Indo-Russian Jewellery Foundation, talks about the role of the India plays in promoting diamonds and raising their sales globally. Alex Popov, 55, is a founder and president of the Moscow Diamond Bourse (MDB) and a member of the presidium of the World Federation of Diamond Bourses (WFDB), which unites almost 90 percent of the world’s diamond manufacturing and trade companies. He has been involved in the diamond industry since 1980s when he emigrated from the Soviet Union to Israel. In 2005, he launched the MDB, the first Russian private diamond and jewellery exchange accepted as a WFDB member. Popov is actively promoting Russian diamond and jewellery industry interests abroad as well as facilitating bilateral diamond and jewellery trade between Russia and India, Sri Lanka, Thailand, China and Israel. He was the initiator of the grand exhibition ‘India: Jewels that Conquered the World’ hosted by The Moscow Kremlin Museum earlier this year. As Chairman of Indo-Russian Jewellery Foundation founded in 2011 in London for the purpose of managing the exhibition's collection, he has been a frequent traveller to Mumbai, India's diamond trading hub, in past several years. He shares his insights on India’s vast potential in the industry. In 2011, you took the chair of World Diamond Mark Foundation (WDMF). What is the aim of this foundation and how it is related to India? The World Diamond Mark, a non-profit organization incorporated in Hong Kong is sort of a new marketing arm of the entire diamond and diamond jewellery industry. Its unique mission is to ensure the healthy growth of diamond industry and enlarge the slice of diamonds in the luxury spending pie. We have been working on the World Diamond Mark marketing program for the past four years. Its implementation is going to start in the fall. The program will address the core issues of the industry through generic marketing, consumer and media confidence in the integrity of polished diamonds. We are setting up a network of Authorized Diamond Dealers, implementing retailer education and training programs and large consumer-oriented marketing activities. The Authorized Diamond Dealer concept will ensure that international diamond business community, represented by the WFDB, will accredit jewellery retailers as Authorized Diamond Dealers which will give better brand recognition of diamonds as a luxury product and will increased visibility of diamonds in jewellery shops and outlets. The cost of the program is around $100 million per year. One of the main drivers of this program is the Indian diamond industry. Major investors are from India, including Bharat Diamond Bourse and Gem Jewellery Export Promotion Council (GJEPC). The World Diamond Mark Foundation in collaboration GJEPC will hold a conference in Delhi in December later this year and will focus mainly on boosting the consumer demand for diamonds globally. Which other countries have supported this initiative? Israel Diamond Exchange, Antwerp Diamond Exchange and other bodies are joining. In Russia, there are three organizations we are in talks with, Moscow Diamond Bourse which is very small compared to Mumbai; just 42 members against 6000 in India, Russian Jewellers' Guild and Russian Diamond Manufacturers Association, led by Smolensk Diamonds (Kristall Production Corporation). We are negotiating with the mining companies. They do have large budgets, but there is always a challenge as mining companies will pursue their own interests, which means the section of the industry we are focusing on, the diamond manufacturers and dealers, will remain untouched. See, there are mining giants like De Beers, Alrosa, and others, there are retailers. Both operate with clear structure of profits and margins. But there is a huge industry that is squeezed in between – the cutting and polishing business, jewellery manufacturers and dealers. They operate on very low margins. Our objective is to help raise the price of diamonds and bring better profitability to this segment. We are also in talks with businesses that are involved in the diamond trade indirectly, banks, insurance companies, special courier companies, auction houses , laboratories. These industries are actually much bigger, at least in terms of number of people employed, than the diamond industry itself. For 28,000 members of WFDB there are about 10 million people employed in related industries. In which countries will you start the diamond promotion first? We are, first and foremost, interested in consuming countries. We begin with, Turkey and Dubai. The next step will be China and Hong Kong. India is the last in the list although it is funding the program in other countries because India has to sell its diamonds. While India accounts for about 80 percent of the world market by the number of employees in this and related industries and 90 percent by the number of stones that are processed here, the Indian market in terms of consumption is still small. And most importantly, Indian retail has not yet reached the level we want it to reach. The retailers' margins are roughly 15-20 percent, it does not allow them to invest in marketing. In India, according to GJEPC reports, cases of undisclosed mixing of synthetic diamonds with natural diamonds have been reported recently. 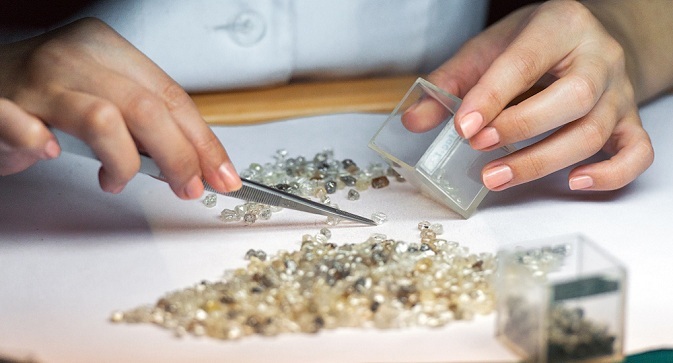 How will the growing market of synthetic diamonds affect the sales of natural diamonds? Synthetic diamonds were earlier used for technical purposes in the medical industry, research and other sectors, but today there are big labs growing diamonds in Malaysia, China and Russia. It is a Russian technology, by the way, which is used by many other countries. There is nothing bad about lab grown diamonds, it is just they are different, man-made. Laboratory-grown diamonds are profitable but only if sold at the same price as natural diamonds. This is cheating. It is true that there have been few cases when dishonest manufacturers mixed natural and synthetic diamonds. Few cases are enough in our industry to lose trust. We are fighting against those who try to certify lab-grown stones, those who are trying to do it on a regular basis. As far as volume of consumption of diamonds is concerned, do you see growth potential in India? India is an economy of large numbers, where the accumulation of capital happens very fast, due to the huge population, probably. Since diamonds, as any other luxury items, are usually purchased with money earned fast and easy, we have high hopes for India. India has a huge potential. Although China is second-fastest growing market, it is a communist state, it is regulated, closed, private initiative is not welcomed, and the most important, there are fewer children. India is rich with youth and children. I see a huge potential in it. And most importantly – Indians love jewellery. It fits into the mentality, as it does in Russia, for example. I see many parallels between Russia and India, we could have a wonderful future together. And I hope we will.